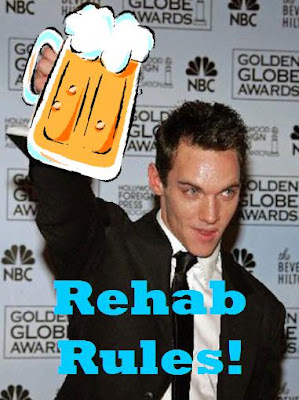 Jonathan Rhys Meyers (I only know what one of those words mean) has checked himself into rehab for a little too much of the drinky-drink. I think that’s the technical term for it. Actually he’s in a super fancy AA facility. Jonathan Rhys Meyers was working so much, according to People Magazine that he needed to enter rehab to maintain his recovery. I can relate to that. One time I worked past 5:00 and felt so burnt out that I drove myself right to rehab. I mean, I don’t have a drinking problem, I just figured that’s what you’re supposed to do. That’s what you’re supposed to do, right? All these movie stars make rehab seem so fun. I’m getting curious. P.S – My photoshopping skills have been brought to a new level.